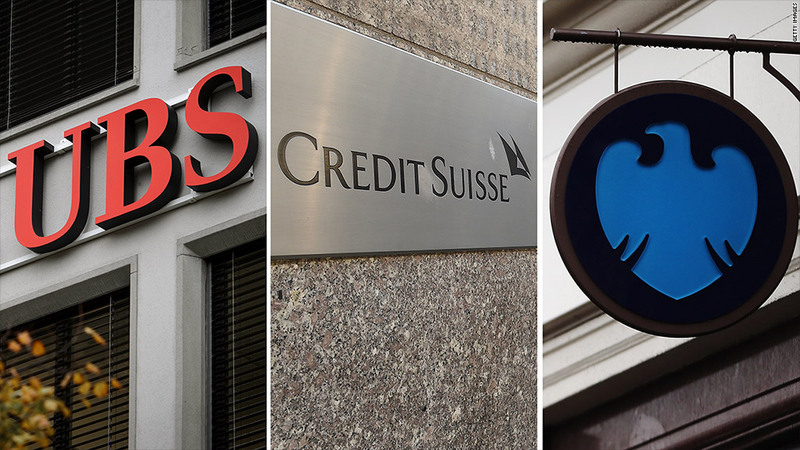 UBS, Credit Suisse and Barclays are facing questions over their "dark pool" trading systems. More banks are being caught up in a U.S. investigation into whether investors lost out by using 'dark pool' trading venues. UBS (UBS) said Tuesday it is being probed over its alternative off-exchange marketplace, where orders are not made public until they are completed. The Swiss bank said it was cooperating with the U.S. Securities and Exchange Commission, the New York Attorney General and the Financial Industry Regulatory Authority in their investigations. The SEC began investigating UBS in early 2012, focusing on some order types and disclosure practices that the bank says it discontinued around the time the probe began. In addition, UBS noted it was among "dozens of defendants, including broker dealers, trading exchanges, high frequency trading firms, and dark pool sponsors" that could be facing a class action suit filed by traders in a New York federal court. According to UBS, the lawsuit claims that it violated federal laws by favoring high frequency trading firms over other market participants. Concerns about dark pools came to the fore last month when the New York Attorney General sued Barclays (BCS) over a lack of transparency. The suit claims the British bank misled investors. The bank not only failed to warn clients about the high frequency trading firms operating in its pools, but it "actively sought to attract them," according to the charges. Credit Suisse (CS) is also facing a spike in questions relating to its dark pool trading activities, according to CEO Brady Dougan. A spokeswoman for the bank would not specify whether those questions were from regulators or investors, and would not comment on whether Credit Suisse was under formal investigation. Deutsche Bank (DB) said Tuesday it has received requests for information from regulators over high frequency trading, though the bank refused to elaborate on whether the probe was linked to the dark pool investigation. The German bank also said it was named as a defendant in a class action lawsuit over high frequency trading. Both banks said they were cooperating with the authorities. Related: Could a flash crash happen again? Dark pools got their name because orders routed through them aren't listed on exchanges until the order is done, so the public is kept in the dark. Institutional investors such as mutual funds, hedge funds and pensions like them because it's less likely that parts of their large orders will get picked off before they're fully executed. If a high frequency trading firm sees the order ahead of time, it could potentially jump in and buy a stock before the mutual fund, raising the costs to the mutual fund.